The Son of a Sailor team is scattered all over the place these next weeks; some of us are in Austin, some in sunny southern California and in Seattle for Urban Craft Uprising. Yours truly has California on the mind and, more particularly in this post, the Beverly Hills Hotel and Bungalow. This iconic hotel is the perfect mix of kitsch and old Hollywood glamour with its pink and green exterior and white 50s font. 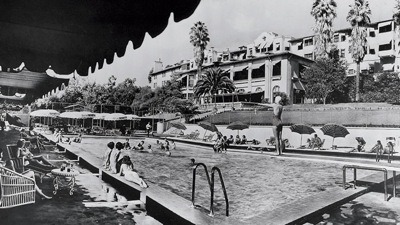 The hotel opened in 1912 before Beverly Hills was even a city. The stars of the era began to move there, beginning with Mary Pickford and including Gloria Swanson, Buster Keaton and Rudolph Valentino. Within the hotel are places and decor that comprise the incredibly glamorous image of the hotel. The Polo Lounge, where Hollywood wheels and deals, the pool area and even the banana leaf martinique wallpaper. 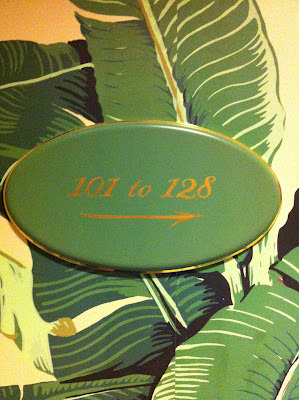 Via Guest of a Guest, I learned a few weird facts about the hotel (and everyone knows the weird facts are sorta more interesting than the history). - Marlene Dietrich forced the hotel in 1940 to institute a “no slacks rule” for women in the Polo Lounge. 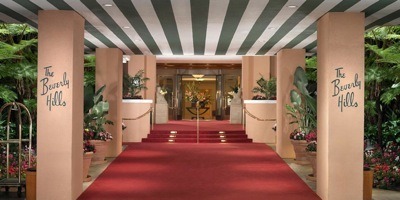 - In 1995 the hotel underwent a $100 million renovation. That is what we call luxury, friends. - Richard Burton and Elizabeth Taylor had a standing room service order of two bottles of vodka with breakfast and another two with lunch. God bless ‘em. Mary Pickford and Douglas Fairbanks spurred the popularity of the hotel back in the the day when they built their mansion on the property.